Thousands of gardens across America are drug labs, according to the Drug Enforcement Administration, which has been visiting gardening stores, florists and seed companies urging them to eliminate the beautiful scarlet poppy which is a ready source of opium. The species, Papaver somniferum, is grown from the tiny seeds which can typically sometimes be found on rolls or bagels. This species is the only one from which opium is produced but it is just as common as other varieties from whose seeds it is indistinguishable. Ridiculous as it might seem, if you carried your poppyseed bagel home from the delicatessen and planted it in the garden, you might have broken the law -- that is if the poppies that grew were opium poppies, and you kept them. The DEA's Intelligence Division was the 1993 publisher of a 30-page, full color book called Opium Poppy Cultivation and Heroin Processing in Southeast Asia which is admirably explicit until you realise what a red herring it is. "Southeast Asia... is ideally suited for the propagation and synthesis of the opium poppy -- geographically, topographically and culturally," it declares, giving not the slightest hint that conditions favor its growth in many other places -- in Californian gardens, for example. It's as though the DEA, by explaining the Asian process so thoroughly, hopes that readers will dismiss the opium poppy as merely an exotic foreign plant. The cover was blown with the publication, by Loompanics, of James Hogshire's Opium for the Masses, according to which it is possible to grow opium from legally available seeds, including those found on supermarket herb shelves, which contain a certain amount of morphine, codeine and thebaine, the principal alkaloids found in opium. Hogshire's book includes recipes for making opium tea, a centuries-old home remedy in many cultures. In March of this year a 20-member Seattle Police Department SWAT team burst into the author's apartment with a search warrant claiming he was running a drug lab. He had been denounced by a former disgruntled houseguest. 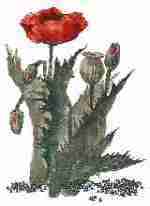 The intruders confiscated several bunches of dried poppies wrapped in cellophane which had come from a florist. Hogshire was charged with "possession of opium poppy with intent to manufacture and distribute." He and his wife Heidi spent three days in jail and could have faced ten years there, but the charge was later dropped. "They came after me because I wrote a book and I don't have the right attitude" Hogshire, 39, complained. Later somebody from the sheriff's office visited his landlady and urged her to evict him. Craig Nessler, a Texas A&M biology professor, who has studied opium poppies for 25 years says, "They can make somebody high, but I don't see it as a threat to public health. To grow enough to become an addict would take an acre's-worth of plants and I don't think most drug addicts are dedicated enough to become farmers." The following month (April, 1997) Harper's Magazine carried a 24-page report of the Hogshire case by editor-at-large Michael Pollan, which he said was his introduction "to what civil liberties lawyers have taken to calling 'the drugs exception to the Bill of Rights'". Over the past several years, in cases involving drugs, the Supreme Court has repeatedly upheld the government's new crop of laws, penalties and police tactics, thereby narrowing the scope of due process as well as long-established protections against illegal search, double jeopardy and entrapment. "The drug war continues unabated; if anything the Clinton Administration is waging it even more intensely than its predecessors, having spent a record $15 billion on drug enforcement last year and added federal death penalties for so-called drug kingpins -- a category defined to include large-scale growers of marijuana," he said, "If ever there was an innocent angle from which to gaze at the opium poppy, our culture seems long ago to have forgotten where it is." At least one federal prison in Florida banned distribution of the magazine containing the article -- a ban that Harpers is appealing on First Amendment grounds. In the letters page of the July Harper's, former police chief Joseph D. McNamara wrote that Pollan's story was "a chilling reminder of the incremental totalitarianism that the war on drugs has produced." Since his retirement, he wrote, he had "tried to expose the hypocrisy, corruption, violence and racism inherent in America's doomed war against drugs... In cities all across the country, thugs with badges have planted evidence, sold drugs, and committed other drugs-related offenses that are often protected by a police code of silence." The national drug policy, McNamara added, was an issue that was largely religious in that the groups which successfully lobbied to criminalize drug use saw it as sinful, "and succeeded in codifying their religious views in the nation's penal statutes. Thus it is that drugs and drug users have been demonized." Associated Press reporter David Foster wrote that Hogshire had made life difficult for the flower trade by spreading information that the government would rather keep quiet -- namely that it's easy to extract opium from poppies grown in gardens across America.. America's war on drugs has marched through the garden gate, making these troublesome times for anybody involved with poppies." Garden stores, understandably, are reticent about revealing what varieties of poppy seeds they actually sell -- even if they have taken the trouble to differentiate one variety from another. So if a gardener is going to gamble on what the seeds will produce, maybe the delicatessen is as good a source. The Harper's story listed seed catalogs from Idaho's Seeds Blum; Park's of South Carolina offering "White Cloud"; Cook's "Single Danish Flag" and "Hens and Chicks"; and Britain's Thompson & Morgan with several varieties of Papaver paeoniflorum. A breadseed poppy called "Peony Flowered" is sold by Burpee whose president George Ball asks, "Do we want to regulate garden flowers? I don't think so." It is possible to germinate poppy seeds bought from a supermarket's spice aisle. Eating such seeds prior to taking a drug test can produce a positive result. Pollan, a gardener himself, pointed out that poppies are pathetically easy to grow. The tiny seeds, not necessarily Papaver somniferum, are mixed with a handful of sand to spread more evenly, and don't even need to be covered. Within ten days, slender green blades can be observed half an inch high and when transplanting allow eight inches between plants. Deep down, Pollan suggested, many gardeners regarded themselves as "minor-league alchemists transforming the dross of compost plus water and sunlight) into substances of rare value, beauty and power... In these days of the American drug war... the border between the sunny country of the law-abiding and a shadowy realm of SWAT teams, mandatory minimum sentences, asset forfeitures and ruined lives is not necessarily where one thinks it is"
Polland's piece explores "the high wall of misinformation and myth" surrounding opium poppies. Pollan says, "If opium is so easy to grow and opium tea so easy to make, the best -- perhaps the only -- way for the government to stop people from growing and making their own is to convince them it can't be done." The word opium comes from the Greek word opion meaning poppy juice. "Dope" comes from the Dutch word for sauce, doop , i.e. anything thick and viscous. The opium poppy, believed to have originated in Asia Minor, was first used medicinally in Egypt, from which it spread to Greece and was then transported by Arab traders to India and China. It was known as early as the Third Century BC, where it appears in the writing of Theophrastus and was used by the Sewcond Century AD Roman physician Claudius Galen who wrote that "opium is the strongest of the drugs which numb the senses and induce a deadening sleep." The anthropologist Weston La Barre has suggested that the earliest use of the opium poppy was for psychic or visionary purposes, used -- like peyote mushrooms or hemp -- in shamanistic rituals. There are references to such substances in Sumerian texts dating back to 4000 BC. Mark David Merlin's On the Trail of the Ancient Opium Poppy (Associated University Presses, 1984), the classic work on the subject, quotes more than 500 academic references. (Merlin writes modestly that he hopes his book will "serve as a baseline study for more intensive efforts"). The 16th century physician Paracelsus, author of scores of books on medicine, dissolved powdered opium in alcohol to produce a tincture he called laudanum whose use became widespread in Europe to relieve pain, control dysentery and as a cough suppressant. Tincture of opium combined with camphor produced the pain reliever paregoric. By the late 19th century, both were widely available in drugstores and there were numerous addicts. Obviously the refining and delivery skills of today have made all such primitive drugs much more potent than in ancient times. Under the 1914 Harrison Narcotics Act, opium-derived substances were placed under federal control, available only by prescription. The opium poppy is grown mainly in China, Southeast Asia, Mexico, Turkey and Lebanon. Opium is prepared by cutting the unripe seed pods of the oriental poppy (Papaver somniferum ) collecting the lactose, and allowing it to dry in a shady area outdoors for several days. This crude opium gradually turns chestnut or brown in color while hardening to a tar-like texture It has an unpleasant odor and a bitter taste that typically produces nausea. Opium smokers increase its purity by boiling it in water until it forms an aqueous solution which is then filtered, the residue being boiled and filtered several times more to extract the maximum yield. Finally the paste is dried and smoked with the user lying down to lessen the impact of the nausea that smoking opium produces. "Opium in its smokable form is apparently all but impossible to obtain today, no doubt because smuggling is so much easier and more lucrative," writes Michael Pollan. Opium was introduced to America by Chinese immigrants who came in the 1850s to work in the California goldfields. Alone and poor, they left their lodgings for little except fan tan gambling, prostitution and opium dens. By the following decade the new vice had spread to the white demimonde, gamblers, prostitutes, conmen and theatrical types. In 1877 the sheriff of Deadwood, Dakota closed ten opium dens which had caused scandal "even among the reckless adventurous spirits... of a rich mining camp." The sheriff declared that he was fearful that this seductive substance would quickly "rob a (white) man of all semblance of manhood." At about the same time in San Francisco, Dr Winslow Anderson reported that as many as 10,000 people had taken up opium smoking, "hitting the pipe" as often as three times each day. The doctor reported "the sickening sight of young white girls from sixteen to twenty years of age lying half-undressed on the floor or couches, smoking with their 'lovers' and mixing indiscriminately." San Francisco promptly passed the nation's first anti-drug law, a city ordinance closing the opium dens, but in 1892 the supervisor of San Francisco's Methodist Chinese Mission reported that "the vice is spreading amongst depraved white people of both sexes... carried on in private houses or in rooms secretly kept by white people." As a missionary in China, the superintendent had noted that opium smokers "lost all capacity for business and interest in work... If you discover your domestic servant to be an opium smoker, go and count your spoons at once and send him off." That year, 1892, the American Medical Association said the time had come to prohibit the import of opium and 20 states subsequently passed legislation to outlaw opium dens and smoking the substance. Nevertheless, in 1896 the writer Stephen Crane estimated that there were 25,000 regular opium smokers in Manhattan out of a population of a million and a half. Whole streets in midtown were lined with opium dens and "splendid joints were not uncommon." Ten years later, dopers had switched to cocaine which, although not sold legally in its pure form, persisted in various medicines. Even young children were regular consumers of Grays Catarrh Powder which contained eight grams of cocaine. Opium consumption reached its peak around the turn of the century when it was estimated that there were about a quarter of a million addicts in a population of 76 million. Crude opium is rarely found on today's North American and European street drug markets. Morphine and heroin, being far less bulky, are much easier to smuggle. Opium contains about 10% morphine, a substance first extracted from opium in 1803 by a German pharmacist, F.W. Serturner, and which found wide use as a painkiller. Its potential was underestimated until the invention in 1853 (by a Scottish doctor, Alexander Wood) of the hypodermic needle. This greatly enhanced potency because of the instant way it accessed the bloodstream. Widely used in the field hospitals of the American Civil War and the Franco-Prussian War, morphine created thousands of soldier-addicts. Morphine and the milder codeine are the only such alkaloids still in clinical use. In 1898, heroin was derived from morphine (of which it has only half the bulk) and was hailed as en even better painkiller and thought at first to be non-addictive. Thus the era of the junkie began. Although opium drugs "can greatly dissipate the anxiety associated with pain" and induce therapeutic sleep, they do not attack the causes of pain, "they merely affect the symptoms of distress" according to Arthur D. Wright in his 1961 History of Opium. Today heroin is considered to have no medical use and its manufacture is illegal. Used medically, opium dulls sensations of pain, controls diarrhea through its constipating action, suppresses coughing, induces drowsiness, alleviates anxiety and gives a feeling of euphoria or well being. "It is the drug's euphoric effect which the opium abuser is seeking, as well as its ability to make him indifferent to hunger, sexual urges, tension and anxiety. Unlike barbiturates, alcohol and other drugs, narcotics do not trigger aggressive behavior. On the contrary, they usually make the user docile and dreamy" (Encyclopedia of Drug Abuse). In his celebrated report on The Opium Habit (Harper & Brothers, 1868) Fitz Hugh Ludlow wrote, "Opium makes the best memory treacherous and, sad as it may be to confess it, the most truthful nature, in matters relating to the habit at least, untrustworthy... the opium eater who by nature would scorn a lie as profoundly as the boy Washington is sometimes so thoroughly changed by his habit that the truth seems a matter of the most trifling consequence to him and his assertion upon any subject whatever becomes quite valueless.... the tendency which opium superinduces to look at every thing from the most sanguine point of view -- the vague, dreamy habit of thought and the inability to deal with hard facts and fixed quantities -- make it necessary to take an opium-eater's assertions upon any subject with a certain degree of allowance -- to translate them as it were into the accurate expressions of literal life." A writer named H.H. Kane (quoted by Jill Jones) reported that smoking opium would evoke "a condition of dreamy wakefulness... a state in which the devotee feels himself on a stratum above his fellow men and their pursuits--at peace with himself and all mankind -- a pleasant listless calm and contentment steals over him... This waking dream, this silken garment of the imagination, will take its shape and coloring from the most cherished and brilliant strands... and puts out of sight the real and unpleasant crudities of life." The mood, however, did not last long. "Then the good spirit of the pipe disappears, giving place to a demon who binds his victim hand and foot." (Hepcats, Narcs and Pipe Dreams by Jill Jones (Scribner, 1996). Long term opium use can cause physical and psychological dependence, creating in the user a craving for the drug and a feeling that life is not worth living without it. Withdrawal symptoms, which develop rapidly and crest within two or three days, typically cause anxiety, restlessness, yawning, tears, runny nose, nausea, diarrhea, cramps, general body aches, gooseflesh and dehydration.